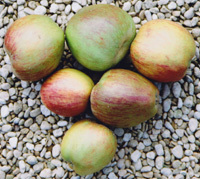 If the historical references are complete, then The Costard is the second oldest known English apple, second only to the Pearmain, which was first recorded in 1204. The Old Pearmain and more than one Winter Pearmain, still known, are probably not the apple of 1204, but that is another story. The age of the Costard makes it very special and it is unsurprising that it has occupied many minds over the centuries. Today it remains a compelling and vexing issue for the many who hope to rediscover it. The quest has become something of a mediaeval romance, where all the pleasures, adventures, intrigues and diversions are in the ‘seeking’ and will probably never be in the ‘finding’. The narrative is a long one, and open-ended. Such have been the long breaks in its recorded history, such has been the confusion between the Costard and the Catshead and so few and inadequate have been the scant descriptions of the Costard, that we barely know what we are looking for. Though some have believed they have re-discovered the Costard, it will probably never be known again with any certainty. It will, however, surely still exist - and probably in many places. For those who share our belief that apples trees can live for 300 years or more, it does not take many occasions where the universal skills of grafting (even in the hands of children) were brought to bear upon replacing an ageing Costard tree, for this most cherished variety to exist today, in our old trees. All the while there are enough wise owners and fruit enthusiasts to graft from old trees, rather than replace with a new variety, the Costard will survive, even if its name cannot be re-attached. Where does the name come from? Undoubtedly it comes from the Latin word ‘Costa’, meaning a rib, a flank or a side. Costa has become the stem of many more words, such as Coast in England or Côte in France, meaning a hillside. So we have our first clue. The Costard is ribbed or sided. An alternative suggestion for the origin of the name comes from various references in Shakespeare plays, such as King Lear, Richard III and Love’s Labour’s Lost, where ‘Costard’ was used in place of a ‘Head’ and even as the name of a character, but there are no supporting usages of the word by others, as a ‘head’, and it must simply have been a favourite word of Shakespeare, perhaps signifying something large and hard – like a Costard. The Oxford Dictionary gives one origin for Costard as ‘applied derisively to the head (arch) 1530’. There is always the possibility that the Costard was originally French. George Lindley, in ‘A Guide To The Orchard and Fruit Garden’, 1831, though wrongly considering that Costard and Catshead were the same (more later) noted that there was a ‘Coustard of the Normandy Gardens’ and there was a Côtard once known on Jersey as a cider apple. Or, perhaps, there was a French version of an English apple. In 1597 Sir Thomas Tresham wrote a document mentioning that an apple called ‘French Custard’ was growing in Mr Dean’s garden at Ely. However, there is no known mention of a Costard in any of the reference works in France, through the ages, though their records have been more comprehensive and often much earlier than ours. In England, the first reference was in 1292 when it was mentioned as Poma Costard in the fruiterers’ bills of Edward the First. The fruiterer to Edward I bought 300 pounds of Costards to supply the entourage when Edward stayed at Berwick Castle, during his campaign in Scotland. Taylor, in 1946, in ‘The Apples of England’, gives a slightly later date of 1297 - when they were sold for a shilling per hundred at Oxford. He adds that the price of 29 Costard apple trees was 3 shillings in 1325. Teresa McLean, in ‘Medieval English Gardens’, 1980, has made some interesting statements but has, unfortunately, not provided references that allow us to follow her trail. We cannot say whether they are hard facts or conjectures. She said “The most popular medieval apple was the Costard, which made good cider and good eating” and “They were good, vigorous growers, their bark yielding a red dye, and they were the national favourite until the 17th century”. McLean comments upon the Earl of Lincoln, who came into the possession of a property at Holborn, subsequently known as Lincoln’s Inn and Lincoln’s Inn Fields, in 1286. He was a keen gardener, having many gardens, and made a substantial income out of selling fruit and fruit trees. She noted that he obtained apple and pear cuttings from the Continent and that “The Costard apple arrived in England at about this time, as did the Pearmain, used for making cider, and they were probably both among the new breeds of apple the Earl imported. We know for certain that he got two cuttings of the Costard.” If the Costard was new from the Continent in 1286 (the earliest date suggested) then it is hard to see how new trees, from two cuttings, would have been capable of generating 300 pounds of apples for Edward’s troops and household in 1292. Another century on, around 1400AD, the Costarde was mentioned in the ancient poem ‘The Pistel of Swete Susan’ but we must then jump nearly two centuries further, during which there was no known mention of the Costard. William Lawson in ‘A New Orchard and Garden’, of 1597-1618, said “Of your apple-trees you shall find a difference in the growth. A good pippin will grow large, and a Costard Tree: stead them on the North side of your other apples...” The first description (albeit brief) came in 1629 when John Parkinson published his ‘Paradisi in Sole Paradisus Terrestris’ and wrote of two different Costards! "The gray Costerd is a good great apple, somewhat whitish on the outside, and abideth the winter’ and ‘The greene Costerd is like the other, but greener on the outside continually". We now have something to pursue. It is a large apple, of quality and lasting over the winter, but with different colours. 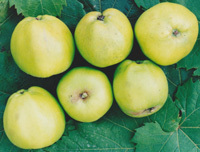 The ‘greene Costerd’ is quite possibly the Green Custard which is still known and is a large green, ribbed apple, which will keep over the winter. For the first time we have the implication that the Costard is a type of apple, perhaps in the ilk of Pippins and Pearmains, rather than a single variety, and Lawson has told us his Costard is a tall growing tree. At this point we have to address the confusion between Costard and Catshead, which seems to have arisen early in the 19th century. Comments upon this will punctuate our narrative, but for the moment we only observe that Parkinson described both Catshead and Costard, separately. From 1669 onwards, through various editions of the ‘Pomona’ attached to his ‘Sylva’, John Evelyn wrote of both Catshead and Costard separately. In 1670, Leonard Meager in the ‘The Compleat English Gardner’ listed three types of Costard, ‘the White, Grey and Red’. John Rea in his ‘Flora seu de Florum Cultura 2nd edition’ of 1676 repeats white, gray and red. John Worlidge in his ‘Vinetum Britannicum’ of 1678 said that he had not seen it but that ‘it was in many places of esteem’. He also noted Catshead separately, as did John Ray in his ‘Historia Plantarum Generalis’ of 1686 who wrote of the Costard-Apple, as well as ‘go-no-further or Catshead’. Ray, who wrote in Latin, said of the Costard “Nor should be omitted from this catalogue that which is called 'The Costard Apple', that was once held in such high esteem, that an apple seller, as a kind of epithet, was known by this name. For they are still today called 'Costard-mongers'”. We are very grateful to Bryan Ward-Perkins and Mark Norman for their help with a difficult Latin translation, beyond our skills. John Mortimer in ‘The Whole Art of Husbandry’ in 1708, repeated Worlidge’s words but added that it was ripe in October. He also wrote of Catshead. Richard Bradley, in his Dictionarium Botanicum of 1728 gives a list of apples "as are accounted the best for Eating and Baking from Mr. Whitmill’s catalogue, Gardiner and Nursery Man at Hoxton". He includes Costard Apple as well as Catshead. Richard Weston, in ‘The Gardener’s and Planter’s Calendar’ of 1773, said the Costard was ripe in December. In 1778, Thomas Mawe and John Abercrombie, in ‘The Universal Gardener and Botanist’, said of the Costard Apple "large, irregular and red striped" and just two lines lower said "Cat’s-head Apple, very large , for culinary uses". We know a little more. 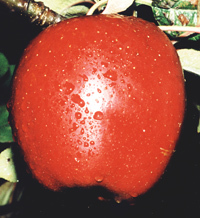 ‘A’ Costard is ripe between October and December, is large, irregular and red striped. Both Costard and Catshead were included in ‘A Brief Catalogue of Fruit Trees, sold by William Pinkerton, Nursery and Seedsman, in Wigan, Lancashire, 1782’. The list included 121 varieties of apple. William Forsyth in ‘A Treatise on the Culture and Management of Fruit Trees’ in editions up to 1810 listed Costard and Catshead. The Costard still appeared to exist and be known into the 19th century, but then a pomological disaster struck. In the first collection catalogue of the London Horticultural Society of 1826 no Costard was listed but there were two Catsheads – ‘Catshead’ and ‘Round Catshead’. This was also the case in the 1831 edition, but the 1842 edition now listed Costard saying ‘see Catshead’ and Costard was given as a synonym of Catshead, under that entry. It still included Round Catshead separately. Catshead was described as being pale green, oblong, large, for kitchen use, top quality and ripe from October to January. Round Catshead was described as yellow, roundish, large, for kitchen use and ripe from December to March. The timing of this allocation coincides with the entry under Catshead by George Lindley, in ‘A Guide to The Orchard and Fruit Garden’ in 1831. Lindley was the most influential authority and writer of the time. Though otherwise meticulous in his research and precision, he made a terrible mistake. He said that Catshead was the same as the Costard of Ray (1688) and for no reason that can be fathomed. Ray had noted both separately as did so many other earlier writers. The ‘synonym-isation’ of Costard led to ‘no further enquiry’ and to its decline, as well as to an increasing plurality of various Catsheads, under the confusion. After this point, the quest becomes very murky. Perversely, the descriptions are fuller and they have been taken in modern times as the yardsticks against which to identify the Costard, but the evidence is flawed. We must address the accounts of the ‘Herefordshire Pomona’ and the fifth edition of ‘The Fruit Manual’. The former was written between 1876 and 1885, by Dr Hogg and Dr Bull, and the latter was published in 1884 and written only by Dr Hogg. There does not appear to be any record to confirm which of Hogg’s writings were completed first. The stark revelation is that the descriptions are inconsistent, and even inconsistent with Hogg’s ‘British Pomology’. 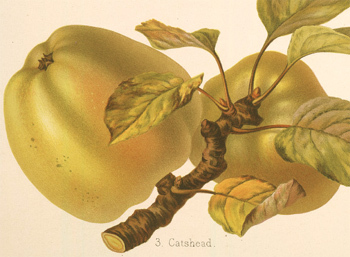 The 1884 ‘Fruit Manual’, under Costard, starts describing the features of Catshead, saying the Costard is “no doubt synonymous with the Catshead and this accounts for George Lindley saying they are the same variety.” He then qualifies the situation and in the same description he says “Modern authors make the Costard synonymous with the Catshead, chiefly, I think, on the authority of Mr George Lindley, who has it so in the ‘Guide to the Orchard’; but this is evidently an error. All the early authors who mention both varieties regard them as distinct.” He points out that there are two other varieties of Costard which “are undoubtedly distinct” namely the Herefordshire Costard and the Gloucestershire Costard. He describes them separately. Neither is quite the description he offers of Costard in British Pomology of 1851. Of Herefordshire Costard he says “Fruit, large, three inches and a half wide at the base, and four inches high; conical, larger on one side of the axis than the other; towards the apex there is a waist, from which it narrows abruptly to the eye, where it is much ridged; it has prominent ribs and an undulating outline. Skin, fine deep yellow on the shaded side, and bright red on the side exposed to the sun, where it is streaked with red and orange. Eye, small, set in a deep narrow basin, with erect convergent segments, half open. Stamens, median; tube, long, funnel-shaped. Stalk, about half an inch long, stout, inserted in a very deep and prominently ribbed cavity, sometimes with a swelling on one side of it, which presses it in an oblique direction. Flesh, white, very tender, with a mild sub-acid flavour. Cells, long and narrow, pointed, ovate; axile, open. A very handsome apple, much esteemed for roasting, and especially for baking; in use from November till January.” He received this apple from Dr Henry Bull, the original tree not being a large one (at about 50 years old in 1884) and having generally been a shy bearer. Of Gloucestershire Costard he says “Fruit, very large, three inches wide, and three inches and a half high; conical or somewhat cylindrical, prominently ribbed, and with ridges round the eye; it is longer conical than the Herefordshire Costard. Skin, almost entirely covered with crimson streaks, mottled with the yellow ground colour which shows between the streaks; on the side which is shaded there is less crimson, but more of the rich deep yellow; the surface is strewed with minute dots. Eye, closed, with long segments, set in a narrow, pretty deep, and plaited basin. Stamens, basal; Tube, conical. Stalk, half an inch long, stout and deeply set in an irregular furrowed basin. Flesh, yellow, tender, sweet, and of good flavour. Cells, large, open, but not wide open like the Codlins, as might be expected from the appearance of the fruit; elliptical; axile. This is a very handsome apple, of good flavour; but more adapted for cooking than the dessert. It keeps well till January.” He was describing a particular fruit, received via Dr. Henry Bull. 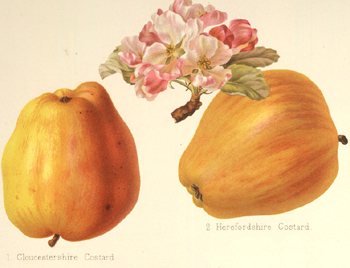 The bombshell is that these descriptions were allocated to different names in the Herefordshire Pomona, such that the Herefordshire Costard in the Herefordshire Pomona carried the description of the Gloucestershire Costard in the Fruit Manual and Vice Versa. The descriptions were not identical but enough phrases were repeated to be confident that some significant error occurred between the publications of the two works. The Herefordshire Pomona included coloured plates of the two apples, which seem consistent with the text attached, but the error makes both publications untrustworthy. The Herefordshire Pomona also misquotes Parkinson (1629) saying that the Costard ‘abideth not the winter’, whereas Parkinson said it ‘abideth the winter’. Hogg’s Fruit Manual did not make this mistake and quoted correctly. We have two descriptions that cannot be attached with any confidence to two names, besides which, neither appears to accord well with the brief descriptions of the Costards that were made in centuries before. The trail of the Costard was rather cold by 1883, when the Royal Horticultural Society held its National Apple Congress at Chiswick. Two different Costards and two different Catsheads were exhibited and described by Barron, the author of the report of the Congress. 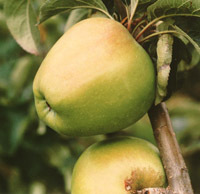 One Costard was exhibited by Cranston Nursery of Hereford and was described as being very large, oblong, green, soft, early season and a fine culinary apple. The other was exhibited by Messrs J. Jefferies and Son of Cirencester, Gloucestershire, being described as small, culinary, conical, tapering, angular, yellow, streaked, acid, mid-season and of third quality. By virtue of season or size, neither could be the true Costard. 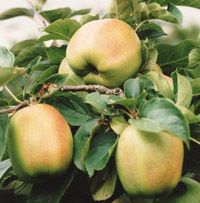 After the subsequent RHS exhibition of 1888, the report included an appraisal of apples suited to growing in Lincolnshire, as selected by Mr Johnson, Mr Picker and Rowson Bros. Nursery. Both Catshead and Costard were included, so perhaps Lincolnshire might still have the Costard growing, if anonymously. The 20th century held no reliable sightings. Taylor, in ‘The Apples Of England’, 1946, said that by the end of the 17th century it was fast disappearing (though there is no evidence to suggest it was disappearing so early). He added that “the apples exhibited at shows as Costard are usually other old varieties.” This statement allows that not all were other varieties. It is hard to know how he could be certain that a true Costard was not among them. He had “not been able to find in England a tree of the Costard” and surmised that “This historic apple seems to have disappeared.” Nurseries still offered Costards but Taylor was probably right and that they were other old varieties. Towards the end of the century and into the 21st the hunt resumed and over-enthusiastic ‘identifiers’ discovered and named several ‘costards’ to add to the multitude coming out of the 19th century. 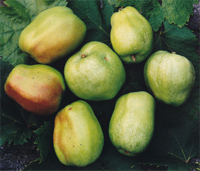 We now have, apart from several apples simply named Costard, the following names - Cornish Costard, Crimson Costard, Coustard, Custard, Custard Apple, Custard Scarlet, Downway Costard, French Custard, Gloucestershire Costard, Green Custard, Greene Costerd, Gray Costerd, Herefordshire Costard, Martin’s Custard, Pope’s Scarlet Costard, Red Costard, Red Custard, Royal Costard, Scarlet Costard, Summer Costard, White Costard, White Custard, White-Costard Gray, Wotton Costard and more added yearly. We might also add in apples called ‘costing’ or ‘costin’, such as Summer Costing and White Costin, which might be corruptions of Costard. Most of these are not now known, their names not being attached to living examples. If we take the view (as we do) that trees can live much longer than commonly supposed and that, in times past, local owners would have grafted new trees for their own use, to replace their ancient ones, and would have passed grafts around, then true Costards are probably still growing as old anonymous trees, of which there is a very considerable number. The concern, in the modern age, is that they are often carelessly and incorrectly awarded the wrong name. The ongoing confusion with Catshead, started by Lindley (1831) and noted by Hogg and Scott, has now resulted in a disastrous number of different apples being identified as Catshead, purely on the basis of being large, green and ribbed. Some might be Costards. We have observed, over the years, that some apples which are not Catshead have been exhibited as such. They are large, green, ribbed, oblong, often with a waist, late season and keeping over the winter. The apple we have named as Wotton Costard is strikingly similar to several sightings of these non-Catsheads, almost all encountered in the western counties. Given Scott’s observations on this regular misnaming, considered above, we wonder if they might just be the true Costard. It is only a ‘might’. What do we really know of the Costard? Not enough! 1. If, in the 13th century it was a single variety, then it became two, early in the 17th century and then three, later that century. It might have been a class of apple, like the Pippin or the Pearmain. 2. If we assume that the old Greene Costerd still exists as the extant Green Custard then we have a shape, form and character to go on. 3. If we believe that really old varieties still exist as living old trees, replicated over the centuries, we can have faith that the old Costards still exist, albeit without their names. 4. If we take Scott at his word, we know that Costards are not as big or rounded as Catsheads and are green, oblong, five sided and late season keeping apples. 5. If we allow the hypothesis that Costards are a ‘type’ of apple we might still find the Herefordshire and Gloucestershire Costards, noted by Hogg and Bull, which are still close enough in time for trees to exist. Unfortunately, the confusion with their descriptions will make it difficult. Of the various apples purporting to be Costards, most can be dismissed. 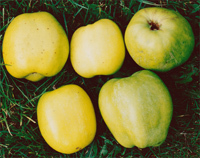 There is a Herefordshire Costard, known and grown in places in Herefordshire, which is a green-yellow ribbed apple and not the red coloured one of Hogg. We have two versions from Herefordshire here, where the fruit has not yet been sufficiently compared, but which might prove to be the same. They might also be the same as the Costard Apple of Hereford which is held at Wisley. Hatfield House have two Costard trees that were planted in the 1970s from trees supplied by the original Keepers Nursery (the apple being different from the Costard being supplied by the current Keepers Nursery). 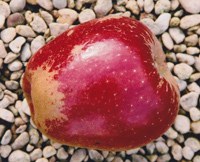 The Hatfield Costard appeared very close to the coloured Herefordshire (or Gloucestershire) Costard of Hogg, but a recent DNA test showed it to be the same as Pope’s Scarlet Costard – an apple bred in the early 20th century. The appearance seemed very different between the two, but it just goes to show how deceptive apples can be. It seems probable that Pope’s Scarlet Costard has turned up in several places as just ‘Costard’. The Costard now sold by Keepers Nursery is a green apple, very similar in appearance to the Wotton Costard, though Keepers inherited this from their predecessors (without any history or provenance) and it would be a remarkable coincidence if they turned out to be the same. 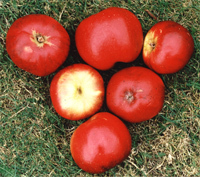 There is also a Crimson Costard known to the Marcher Apple Network in Herefordshire, though we have not seen it, or know of the provenance of its naming. We also have to consider a set of apples, very similar, if not the same, named Catshead in the western counties but which are wrongly named. The ancient Wotton Costard is also very similar in appearance to these. It is hard to have faith in other contenders. All those brought into the National Collection at Brogdale, under the name Costard, have been found to be wrong. Their Costard (Supposed) and Costard (Howlett) are both Pope’s Scarlet Costard. In conclusion, frustrating as it is, and dispiriting not to be able to find such an ancient apple, we must accept that re-connecting the name to some old tree (which will still exist) cannot be done with certainty. It has been our compelling experience that the more an apple is described, the greater are the inconsistencies and the greater the confusion. We just don’t have enough reliable information to go on. Perhaps there will be some old document, buried in some archive, that will unlock the mystery. For those of us who savour mystery and who set The Quest above its resolution, there will be a perverse hope that the Costard will never be found. To look at an apple from some ancient tree and say ‘I wonder if….’ is the greater pleasure. Regardless, the quest will go on.